Wild comfrey (Cynoglossum virginianum) of the Borage (Boraginaceae) family is a short perennial with large leaves and pale blue flowers. In the US, it occurs from Texas to Illinois to New York to the Atlantic and Gulf Coasts. In Arkansas, it occurs statewide except for some areas of the Mississippi Alluvial Plain and lower elevations of the West Gulf Coastal Plain. The genus name, from Greek, translates to “hound’s tongue” in reference to leaf shape. The specific epithet references the State of Virginia from which it was originally described. It is also known as giant forget-me-not and hound’s tongue. Preferred habitat is open woodlands of ridges, slopes and bottomlands with rich moist soil where competition is low. Photo 1: In its preferred habitat, a seeded colony stands out. Wild comfrey has a ropy taproot from which new growth emerges from one or two buds in early spring. It may have a basal rosette of leaves only or, on more vigorous plants, a leafy flowering stem as well. Stems, to 2 or more feet tall, are erect, with the upper portion tending to be fistulose (hollow). Stems terminate with two divergent arching floral branches, often with an additional one or two widely separated branches below. Floral branches are initially coiled with flowers along the upper side in two ranks, alternating from side to side (a scorpioid cyme). A single flower may occur between the two apical floral branches. Each floral branch has up to 10 or more flowers. With large erect to ascending leaves, flowers seem to float just above the bulky plant. Photo 2: In early spring, the first leaves are rising from the duff. On a flowering plant, lower leaves are closely spaced along the stem while upper leaves are widely spaced. Large lower leaves, which may be ten or more in number, are elliptic with a gently tapering base and an acute apex. Largest of the lower leaves may be 14 inches long, including 4-inch petioles, and 4 inches wide. Lower stem leaves have wings that extend a short distance down the petiole. Above mid-stem, leaves become smaller and widely spaced with longer and wider wings so that leaves are sessile. These mid-stem leaves also become clasping and one or two leaves have ear-shaped appendages (auriculate) at their base. The uppermost several leaves are broadly lanceolate and clasping. Floral branches are leafless. Photo 3: Mature plants produce a stem that terminates with the inflorescence. Upper stem leaves, with a broadened base, are sessile and clasping. All leaves of wild comfrey are alternate with entire margins. Leaves are a medium green above and a light green below with yellowish petioles and main veins. Leaves have a sunken upper midrib and a prominently expressed lower midrib. Widely spaced pinnate secondary veins gently arch toward leaf apex while tertiary veins are reticulated and obscure. Wild comfrey is heavily pubescent with fine, spiky hairs uniformly spread along the stem and both sides of leaves, along with ciliate leaf margins. Pubescence extends into floral branches and onto pedicels (flower stalks) where hairs are shorter and appressed. Pubescence is not present on the concave upper side of the sharply edged petiole or along the upper midvein. Pubescence of lower leaf surface is shorter than that of the upper surface. Stems and petioles feel hirsute while both leaf surfaces feel soft. Flowers open about mid-May as the coiled cymes straighten. All of the two to five cymes on a stem develop at the same time with flowering proceeding from proximal to distal end. By the time the distal flowers are in bloom, fruits of the lower flowers are already well formed. Flowers are present for about a month. Photo 4: This early stem, with inflorescences still crowded, terminates with two divergent scorpioid cymes with a separate lower cyme. Flower buds are whitish with pink overtones, with corollas set in a medium green to purplish, densely pubescent calyx. Calyx lobes are twice as long as the calyx tube. With anthesis, corollas become pale blue. Flowers, up to half-inch wide, have a short tubular corolla with five lobes.. Lobes have whitish, raised appendages at their bases that form an elevated ring around a gaping throat. Lobes are oval and weakly flared with crinkly margins. A pistil and five stamens do not exsert from the corolla tube. Stamens, with short filaments adnate to the corolla tube immediately below the gaping center, have elongate lumpy anthers. The greenish stubby and erect style, positioned below the anthers, attaches to a round ovary. Photo 5: Whitish buds become pale blue as flowers reach anthesis. Note elevated ring around throat and dense appressed pubescence on pedicles and calyx. With fertilization, flowers immediately begin fruit development. The round ovary divides into four ovoid segments, each of which may produce a mature nutlet. Mature nutlets are grayish brown with a spiky clinging surface. Nutlets are dispersed by gravity, water flow, or various mammals to which the nutlets cling. Photo 6: Whitish flower buds are nearer distal end of coiled cymes than blue flowers. Ovaries split into four spiky nutlets while style is still present. For a shaded moist garden or natural area with minimal competition, wild comfrey should be a favored selection. With or without a flowering stem, the leafy plant is showy, especially in spring when it quickly reaches its maximum height. The pale blue flowers provide a subtle show. Wild comfrey is not noted for aggressive self-seeding; however, seeded cymes may be easily removed. It is not favored by deer. 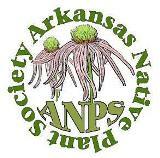 In addition to wild comfrey (Cynoglossum virginianum), other species in the genus that have been recorded in Arkansas include three non-natives: 1) hound’s tongue or garden comfrey (Cynoglossum officinale) (in several northern counties), 2) Ceylon hound’s tongue (Cynoglossum zeylanicum a.k.a. Cynoglossum furcatum) (in several southwestern and central counties) and 3) blue hound’s tongue (Cynoglossum creticum). These species can be readily distinguished from Cynoglossum virginianum: Cynoglossum officinale has downy stems, small leaves and purple to reddish flowers. Cynoglossum zeylanicum, with blue flowers, is a tall multi-stemmed species with small lanceolate leaves and more numerous and longer floral branches. Cynoglossum creticum has smaller, narrower and stiff leaves, with many leaves up stems. These introduced species are often found in disturbed areas. This entry was posted in Know Your Natives, Native Plants, Wildflowers and tagged Boraginaceae, Cynoglossum, Cynoglossum virginianum, Wild Comfrey. Bookmark the permalink.